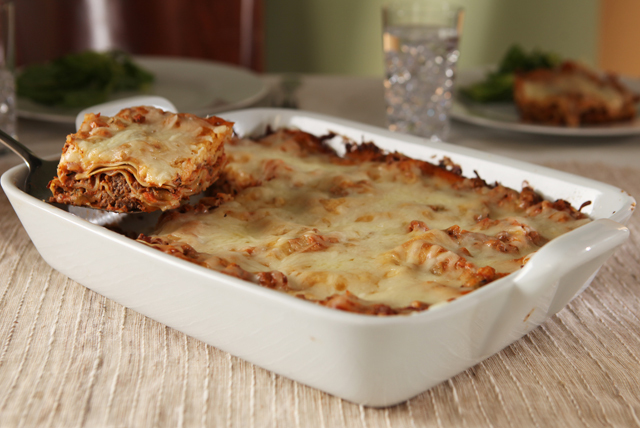 This quick-to-prep version of hearty lasagna is made with fresh eggplant, ground beef, a shredded five-cheese blend...oh, and then some more cheese. Microwave eggplant in large microwaveable bowl on HIGH 6 to 7 min. or until tender. Meanwhile, brown meat with onions and garlic in large skillet sprayed with cooking spray on medium heat. Add pasta sauce, cream cheese spread, milk and eggplant; mix well. Cook and stir 2 to 3 min. or until heated through. Remove from heat. Spread about 1-1/2 cups sauce onto bottom of 13x9-inch baking dish sprayed with cooking spray; cover with 5 noodles. Repeat layers twice. Top with remaining sauce, shredded cheese and Parmesan. Cover. Bake 1 hour, uncovering for the last 15 min. Let stand 10 min. before serving. Serve with a fresh fruit and a side salad to round out the meal. Spray foil with cooking spray before using to cover the lasagna before baking. Lasagna can be assembled in advance. Refrigerate up to 24 hours before baking, increasing the baking time if needed until lasagna is heated through.